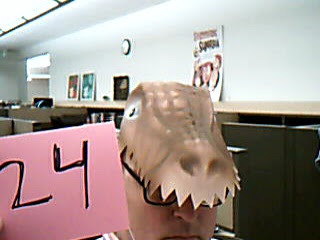 Day Twenty-Four / Hat Twenty-Four: Foam-like crocodile head (upper jaw only) with serrated teeth. The second piece of headgear in the NC series, I don't know much about the provenance of this hat except for the fact that it would probably get me noticed if I wore it while partially submerged in a Floridian marsh. I mention Florida for two following reasons: 1) I'm not totally sure this is a crocodile and not an alligator -- ---- though according to an explanation by the folks at Animal Planet I'm in the clear since "All alligators are crocodiles, but not all crocodiles are alligators" -- and 2) I seem to recall from my trivia monkey days that Florida is the only place where the critters we commonly refer to as crocs and gators (crocodylus acutus and alligator mississippiensis respectively) live side by side. And now you know it too!